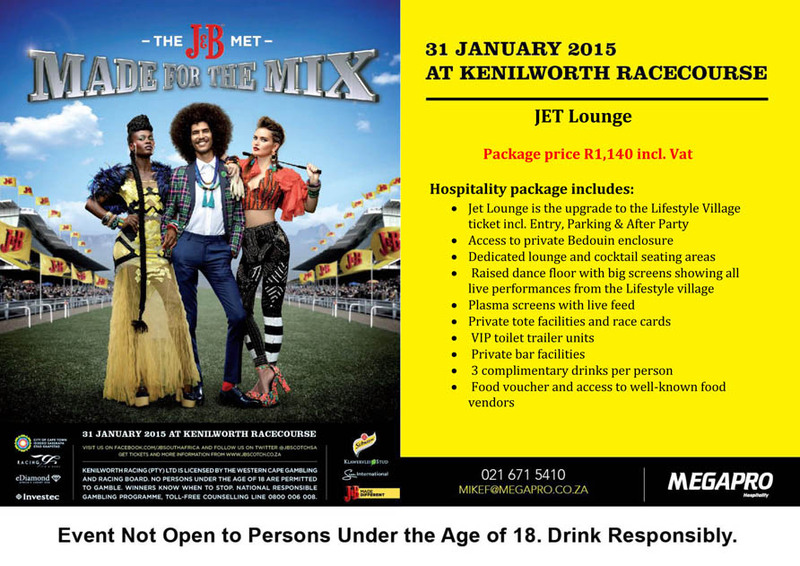 Experience the merger of equestrian prowess and high fashion at one of South Africa's most celebrated outdoor social, fashion and sporting events of the year, the J&B Met, at the Kenilworth Racecourse in Cape Town on Saturday, 31 January 2015. The theme for the 38th edition is 'Made for the Mix' and aptly celebrates the unique result that comes from mixing contrasting elements and encourages the well-heeled to shake things up on the fashion front with multiple styles of sophisticated and glamorous fashion. This is no ordinary day at the races as the equestrian pageantry of the J&B Met mixes with ground-breaking haute couture that challenges conventions and celebrates bold attitudes. It is about decadence, debauchery and more importantly 'who' you're wearing on the day. 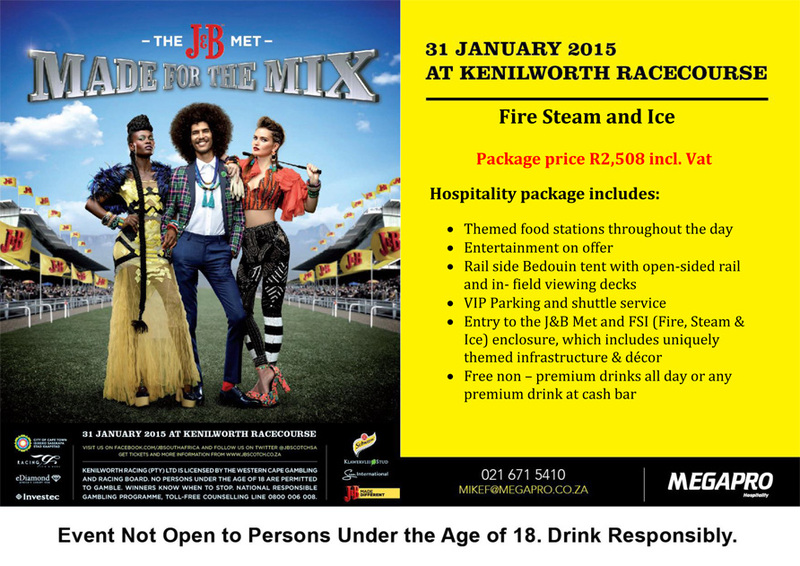 Expect scintillating horseracing, experience high fashion, rub shoulders with the who's who of South Africa's business and social scene, and dance the night away courtesy of J&B and Megapro with these exquisite packages to suite every taste and budget. Don't miss out on the social event of the year!!!! Lifestyle Village is available at R495-00 and includes entrance fee of R125-00 and includes the After Party ticket of R250-00. 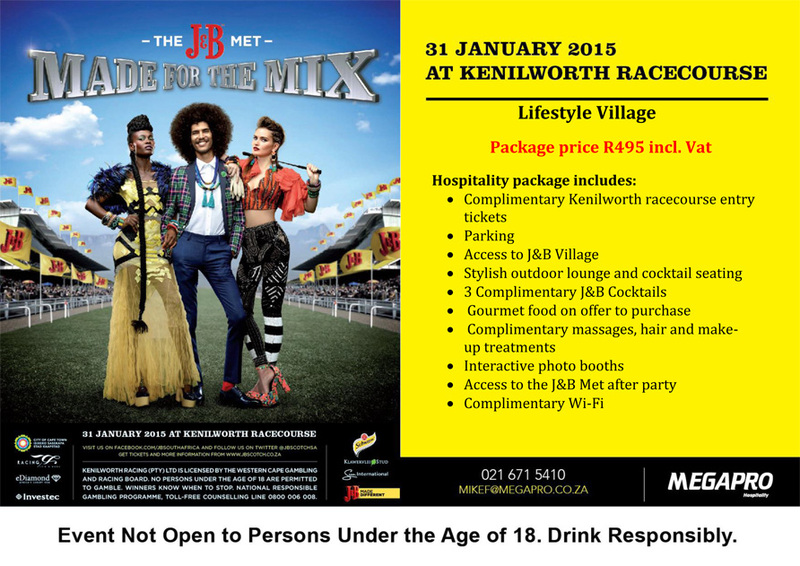 Only the first 1000 tickets will be available at R495-00 thereafter it will cost R125-00 more.